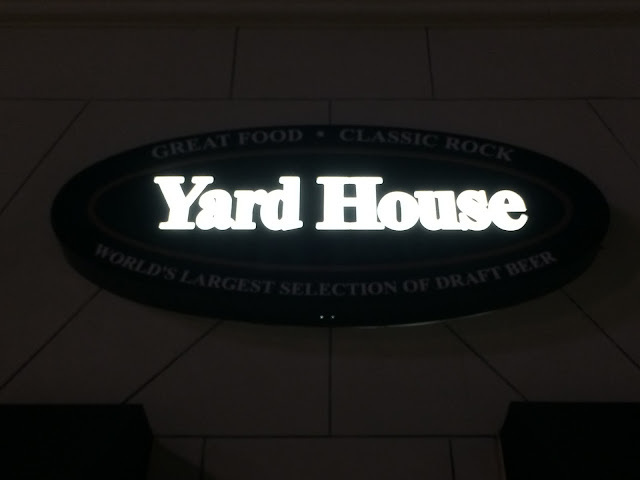 Monday night my wife and I were given the opportunity to celebrate with Yard House for their 19th Anniversary at their Hallandale Beach, Village at Gulfstream Park location. In preparation for their birthday, Yard House sent a team to Rogue Ales in Newport, Oregon to create and brew a beer with Brewmaster John Maier. Why Rogue? 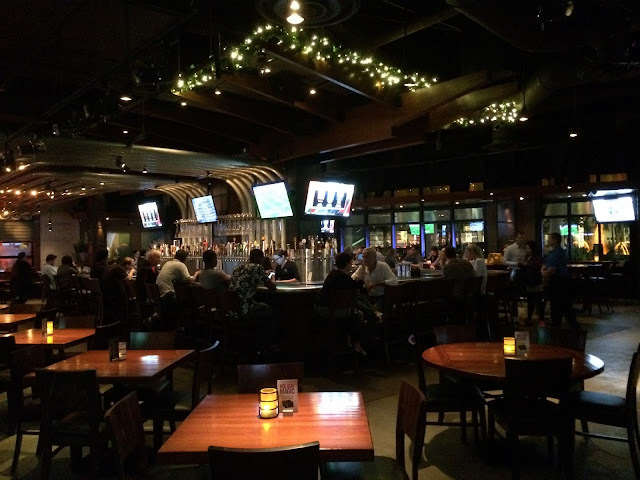 Well, since opening the first Yard House in 1996, there has been at least one Rogue tap at every restaurant continuously for all 19 years! Sounds like a pretty good partnership to me! 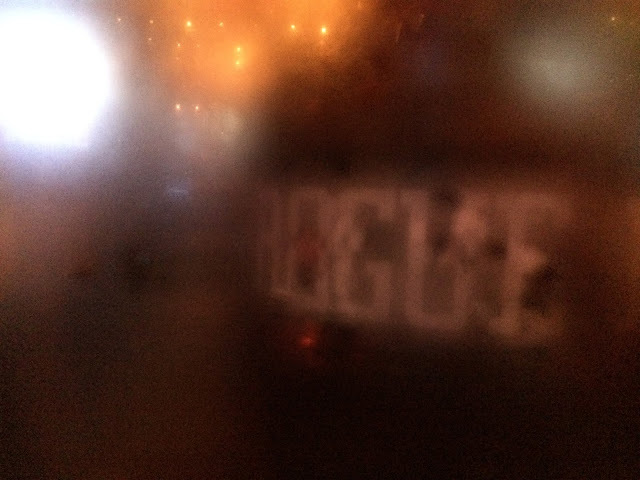 The result of the brewing collaboration was Rogue Spruce Tip IPA, a beer only available at Yard House for a limited time, and just tapped a few days ago (December 7th). We were greeted at the restaurant by General Manager Adam Ostertag and server Brandi. After Brandi carded my 40-something wife (which she thought was awesome), she went for a few pints of the new beer. 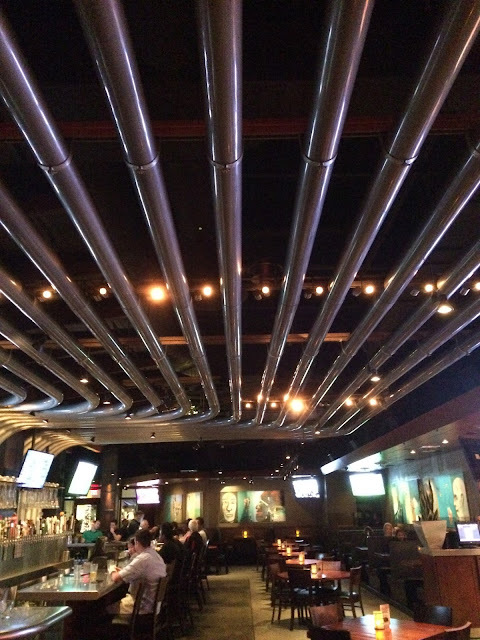 We chatted with Adam about Yard House and their partnership with Rogue. 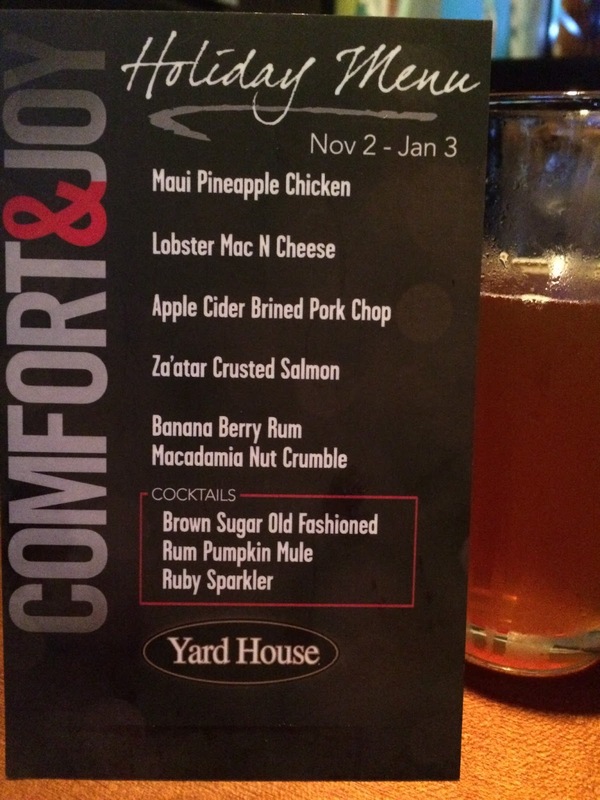 I saw that Yard House had developed a special Holiday Menu (available now through January 3, 2016), so we asked for recommendations for an entree. Adam said the Apple Cider Brined Pork Chop was his favorite. Brandi also recommended the Lobster Mac N Cheese and told us we couldn't leave without also having the Banana Berry Rum Macadamia Nut Crumble for dessert! After walking around the bar, which you physically need to do to see all the taps, and taking a few pictures, my glass of Spruce Tip IPA was waiting for me. What an excellent and flavorful beer! While there is a terrific caramel and malty backbone flavor, the spruce really stands out! Citrus, a little fruity and lots of evergreen. Very refreshing, not overly bitter, definitely unique. We decided to order the two recommended dishes and share each. I also ordered another beer, of course sticking with the Spruce Tip IPA. 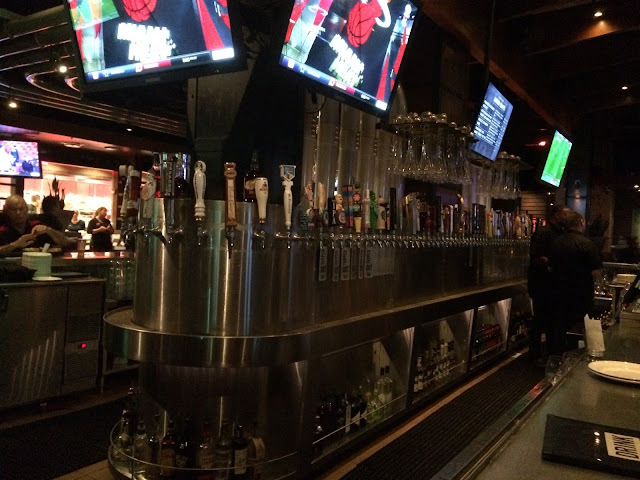 All of those other taps looked pretty inviting, but they will need to wait for a return visit! Our food arrived shortly after and looked amazing! The pork chop was served with brussels sprouts, butternut squash and an apple honey sauce. 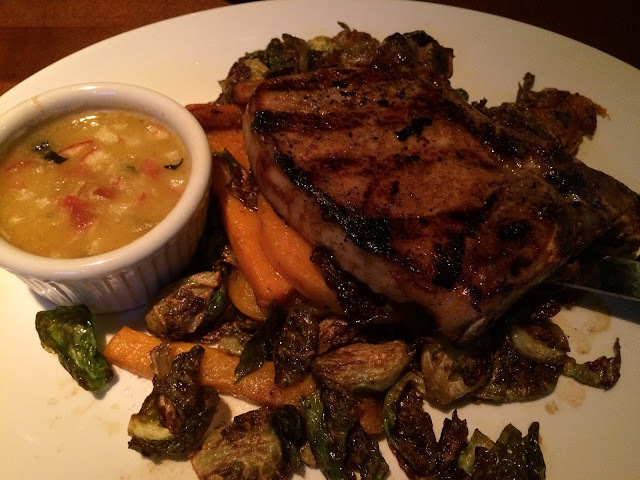 That pork chop was so juicy and the crunchy brussels sprouts and tender sweet squash made the dish a home run! 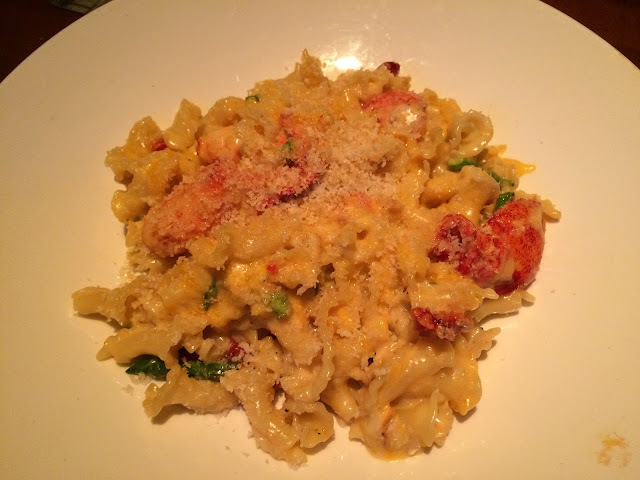 The Lobster Mac N Cheese was equally delicious. Sooo cheesy! Huge pieces of lobster! And then there were some unexpected wild cards that just stood out and contrasted against that rich goodness perfectly. Tender asparagus, mushrooms, and sundried tomatoes just put this dish over the top. We were very full, but Brandi brought me another beer and put in an order for the Banana Berry Rum Macadamia Nut Crumble. 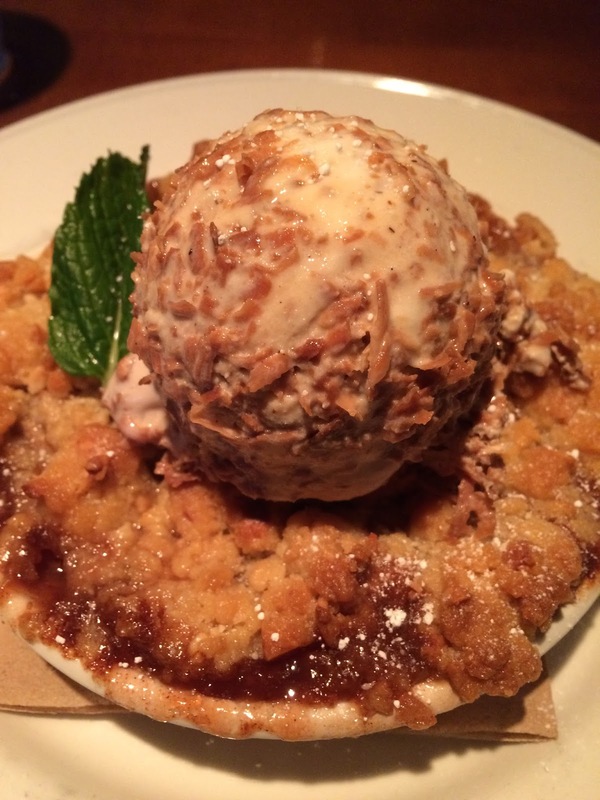 To our surprise and delight, the crumble is topped with the most awesome toasted coconut ice cream ever! Imagine bananas and berries soaked in rum and baked with the most awesome topping. Then mix the bites with that cold ice cream contrast! Outstanding is an understatement. One of the best meals I've had in a while. 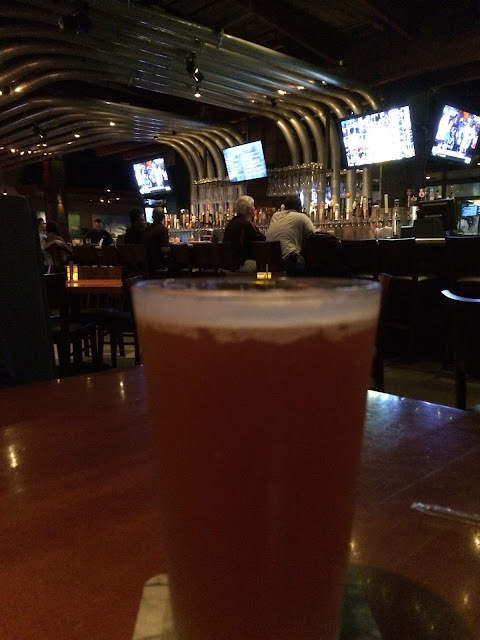 And that beer was definitely worthy of a special occasion like a birthday/anniversary.Yard House in Hallandale Beach has an excellent atmosphere and of course a long ample bar with as many beer taps as you probably have ever seen in one place. What a great craft beer selection too! Thank you for the wonderful evening and hospitality-everything was perfect! I'll be back for sure!